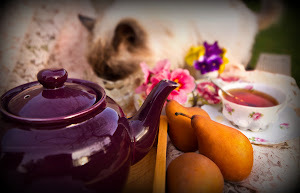 Each time our family visits Aunt Cella, the two of us make a special effort to spend a day at tea. 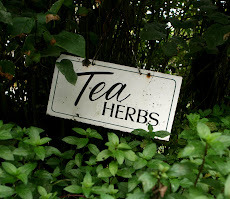 That's right, not just an afternoon tea, but an all day long tea! This year was no exception. We didn't sip and eat the entire time, but spent much time chatting, looking at linens in her cedar chest, and admiring old-fashioned handiwork and vintage tidbits from Grandma's life. Two years ago we enjoyed a Peter Rabbit tea together. You can read about it here or for the entire post, check the archives for December 30, 2005. 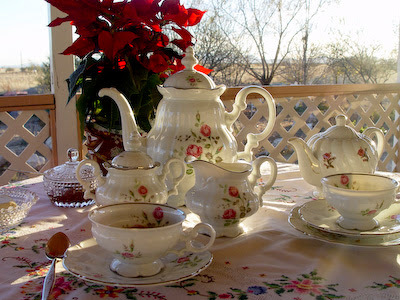 This year Aunt Cella chose to use her Moss Roses Tea Set. What a pretty presentation it made! 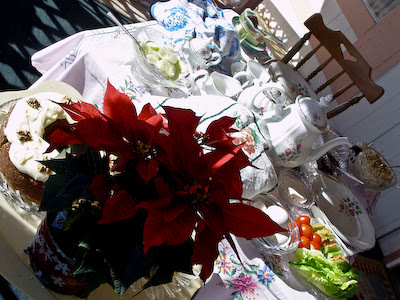 Although it's December, we always have our tea parties outside on the porch. 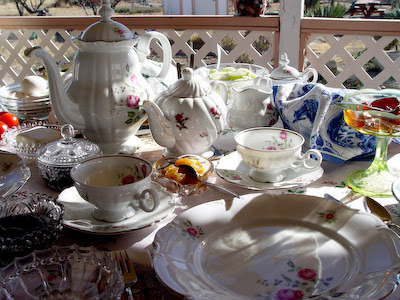 The warm Arizona sunshine is pleasant and comfortable, making the tea party a cheerful and enjoyable experience. Aunt Cella and Uncle Mike lived in Germany for thirty years. Yearly they would take a trip to beloved England (sometimes together, sometimes individually) to explore the countryside and to take tea at manor houses, castles, and cottages. 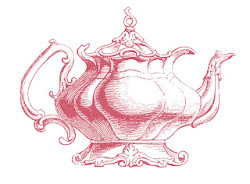 The tea offerings available at each place they stayed were always considered when selecting accommodations. Aunt Cella enjoys hearing all about how Americans have altered the afternoon tea experience to our own expectations of 'proper'. And she has added elements of her own to a traditional English tea. 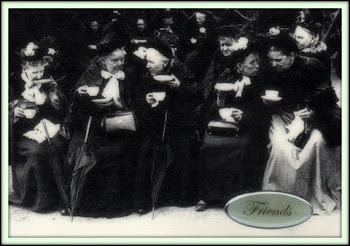 More like a high tea, Aunt Marcella's teas are always delicious and satisfying. 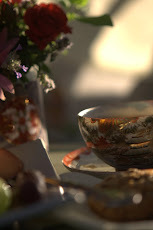 Aunt Cella selected a beautiful embroidered tablecloth which enhanced the table-setting nicely. 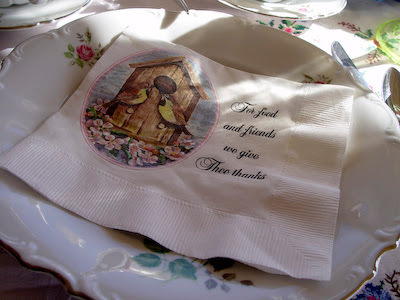 A lovely verse on the napkins added to the welcome feeling of the table. Aunt Cella is always a gracious hostess and the conversation is lively, entertaining, and informative. From family topics to serious spiritual discussions, our visits are always cherished and precious. What a precious treasure! Aunt Cells sounds like someone I would love to meet. And tea on the porch for Christmas, could there be anything better? What a dream! So glad you got to go south to visit once again. 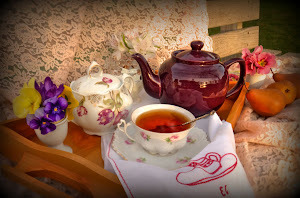 Thank you for sharing your day, Aunt Cella sounds just lovely, and I LOVED reading about her tea travels and your days menu. Yum! the food sounds delicious! 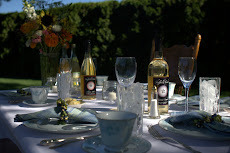 the table setting is gorgeous and i'm sure the company and stories were the most memorable part! i always love those times-embracing tradition, embracing the past, restoring the future.....restoring ourselves. thank you for sharing the details! what did they do in germany during that time if you don't mind me asking? i'm intrigued! i keep contemplating europe and i'm trying to figure out how other people do it!! What a lovely way to spend a day! 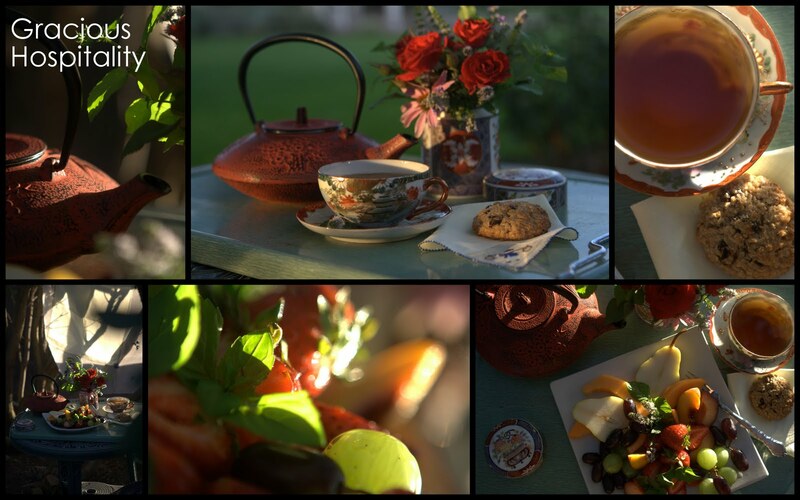 The tea sounds delicious, the setting is beautiful...what more could you ask for?! Happy New Year to you! Reading this has been delightful for me. I am glad that you and your aunt know how to honor and create an occasion. 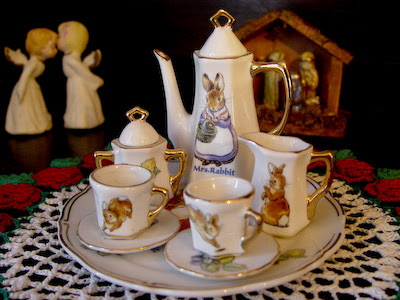 The Peter Rabbit tea set is delightful. How special to have an "Aunt Cella" to take tea with! Everything looks lovely, and sounds divine! 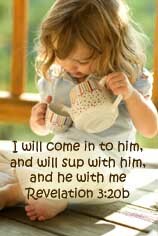 I wish I had someone to have a tea party with! 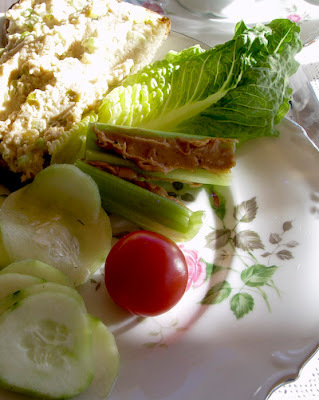 I apologize for being behind with my comments on your blog! It's always so beautiful!